They come in various guises, but however you want to describe them, taxes and gratuities can mount up; resulting in significant, and often unexpected, additions to the cost of a vacation. Bermuda is often referred to as a tax-haven or a tax-neutral jurisdiction. This leads many to believe that there are no taxes in Bermuda. The assumption is incorrect. The government has significant expenditure to finance (it’s the island’s largest employer by a long way) and collects around one billion dollars in taxes each year. A significant proportion of this is collected from tourists and business visitors. • Passenger Departure Tax (Aircraft) – Visitors departing Bermuda by plane pay $35 departure tax. There are a few exemptions including children under 2, air crew, and passengers in transit. The tax is included in the price you pay for your ticket, so no surprises here. • Passenger Departure Tax (Cruise ships) – Departure tax of $20 per passenger for each 24-hour period the cruise ship has been in port, up to a maximum of $60. The tax applies between April 1 and October 31. This tax is included in the price of your cruise ticket. • Passenger Cabin Tax (Cruise ships) – This tax is $14 per passenger cabin between May 1 and August 31, and $10 per cabin between September 1 and October 31. It’s already included in the price you pay for your cruise. • Yacht Arrival Tax – Yachts are liable for arrival tax of $35 per person. Children under 2 are exempt. The tax is collected by the customs officer when the yacht is clearing customs and immigration at Ordnance Island in St George. • Hotel Occupancy Tax – Visitors staying in hotels and guest houses pay 7.25 percent hotel occupancy tax on top of the room rate. Check carefully whether this is included in the rate quoted when booking. • Tourism Guest Fee – Visitors staying in hotels and guest houses are also liable for 2.5 percent tourism guest fee. Many hotels include this within the hotel occupancy tax, so you frequently see a hotel occupancy tax of 9.75 percent quoted. Again, check whether this is included in the rates quoted. • Customs Duties – Visitors enjoy the following duty free allowances – 1 litre of spirits, 1 litre of wine, 0.5 kg of tobacco, 50 cigars, and 200 cigarettes. Goods in excess of these limits attract customs duties. Tips can also add a lot of expense to your vacation costs. They’re a controversial issue in Bermuda as many are usually added to your bill automatically. • Restaurants – Nearly all restaurants in Bermuda automatically add a tip to your check. It’s usually 15 or 17 percent. There are only a handful of restaurants on the island that don’t follow this practice. They include the Swizzle Inn, Swizzle Inn South Shore, Mad Hatters, and the Speciality Inn. • Hotels – Most hotel bills are subject to a service/gratuities charge, usually 10 percent. Some of the larger hotels/resorts also a daily resort fee or levy. This is supposed to cover things such as use of the health club. Again, check whether this is included in the rate quoted when you book. • Cruise Ships – There was a time when cruise passengers left cash in envelopes for individual crew members that had served them. The cruise lines visiting Bermuda now encourage or require tips to be pre-paid. For example NCL charge a fixed service fee of $12 per person. It’s added to the cost of the cruise and can be paid up front or on board the ship. A gratuity of 15 percent on bar bills and 18 percent on spa/salon bills is automatically added. Royal Caribbean and Celebrity have similar policies. • Taxi Drivers – Most taxi drivers expect a 15 percent tip, more if they’ve done some heavy lifting. • Gas Station Attendants – $2 to fill your scooter with gas should be about right. We recently stayed at the Fairmont Southampton. While we love the island, it will be our last visit. Bermuda has always been expensive. However I also don’t agree with the “gratuity policy”. Is it law? We found the service wasn’t what it was in the past, as there is no incentive for the staff to earn said gratuity. Prices are out of this world for most goods and dining out. We were told it’s because everything has to be imported. How does importing affect gratuities. I wonder if these gratuities are in addition to wages or a part of their wages. While the island is as beautiful as ever, sadly we won’t be back. I just came back from Bermuda. I feel that 15-20% is a fair amount to tip, but it must be at the discretion of the customer, otherwise servers become complacent and service deteriorates. This is what I saw in Bermuda. I am not a needy customer, but I expect prompt and courteous service. In general I got neither from Bermudian staff. I hate to generalize but the only good service I received was from non-Bermudian staff. I do not like the idea of an automatic gratuity. (TIP) tip means ‘To Insure Proper Service’. Why would anyone pay for something upfront? I called the hotel and they said it is their policy. For the maid, pool attendant etc. If the maid did a good job a tip would be in order. But they don’t always do a perfect job. They also charge a resort fee. They also charge a 17% gratuity for food service. There are way too many tips. They even charge a gratuity for a 5 month old baby. Now that is not right. Hotels should not expect the low paid maids to rely on the guests. Thanks for your thoughts. You didn’t mention the hotel concerned but I can guess. For what it is worth I think you are wrong about the origins of the word ‘tip’. The Wikipedia article on Gratuity has some useful reading on its etymology and history. The acronym TIP means To Insure Promptness. Paying a tip in advance only guarantees that the server receives a gratuity. It gives the server no incentive to provide exceptional service. In fact, the server could easily provide poor service. How did this practice ever get started? According to the article in Wikipedia you cited, the word tip has unknown origins. I suspect that the definition Bonnie gave is a modern American acronym, not an official dictionary definition, because it comes from the 17th century, according to my Oxford English dictionary. Just a side note in answer to your statement, not really relevant to the original subject of conversation. Many have commented that the tips are necessary because the waiters earn a low wage. What I was getting at when talking about the system in Europe is that there is no logical reason why waiters can´t be paid a living wage like any other job, and hence so called tips become unnecessary. Their job requires giving a good service to the client, so if they don´t comply with that, then they should be thrown out, just as say an office worker would if he didn´t toe the line. Why tip someone for only doing what their job requires them to do? If you follow the logic of having to supplement people´s low wages, then why not tip shop assistants, the parking meter attendants, bank tellers and anyone else you can think of? Wouldn´t it be nice if the US, Bermuda etc. were to follow the normal system of most places in Europe, and include a note on the menu stating that service and taxes are included? In general people in Europe don´t expect a tip as they get their salary just like any other employee does. I lived in Holland for some years and found that there, a waiter can be offended if you offer him a tip. He has pride and doesn´t consider himself to be any different from an employee in any other job. Why should he be made to feel subservient and have to live on tips? As far as BDA is concerned, if tips were really voluntary, the majority of service staff would be bankrupt as in general the service is very poor. I entirely agree with giving a tip for good service. Me and my friends would normally give 10% in the UK. I think the amount I tip should be up to me on the basis of the service I have had. I have often given a much larger tip for very good service but do not feel the need to over tip when if eating out the establishment should price its food and drink at a price that allows the staff to earn a good wage and tips as an extra. I work in a service industry and do not get tips from our customer for my great service and if I wish to earn more money I have to do overtime. Regardless of what it is called, the 15% gratuity that is added to your bill ‘for your convenience’ as often stated on the menu is NOT mandatory. What people don’t often know, and are not told by the establishment (obviously) is that you do NOT have to pay the 15% if you don’t feel that the service was up to par. I live in Bermuda and on a few occasions when I have eaten out and the service has been less than stellar, I have refused to pay the full 15% and that is my choice as a patron. The majority of the time the service is fine and the addition of the 15% is convenient. The bottom line, don’t like the service don’t pay, or pay what you feel is acceptable. You have the right to refuse. A tip is a tip and a charge for service is just that. Tipping should be for service above the normal. Tipping is spreading across the world even where staff are paid a adequate wage. I live in London and we get charged service charge over here. I hardly ever pay it because I know the establishments take it for themselves and the waiter is lucky to get 10p in every pound. Some establishments are even cheeky enough to take breakages out of service charge before dividing it amongst the staff! So, I always ask for the service charge to be removed and give the waiter a cash tip. I have never had a waiter say anything negative about doing it this way – in fact, it’s always met with a positive reaction as they get the full tip as deserved. I do not like the automatic service charge as it de-motivates staff to give good service because at the end of the day, they know they will hardly see any of it. Bermuda has a consumption based tax system. You pay tax at the rate u choose to consume. The now 17% SERVICE charge is in fact a TAX. That tax is used to pay salaries. There is no uniform standard for the division of this revenue amongst staff. Some establishments are very fair others are less than fair. The service charge is equivalent to paying GST & PST for Canadians or State and Federal tax for Americans. It is not a TIP its just how our economy works. Sorry Charles although I agree with most of what you have stated, the 17% Service Charge is not a TAX in Bermuda. It was passed in legislation after a long battle with BIU employees that no service charge or gratuity will be considered a TAX. Purpose being that much like other places if it was considered a tax employers would be able to distribute the “service charge” how they felt i.e. portions to the establishment and other employees as they feel. However, the tips, service charge and gratuities do make up a great deal of service workers in Bermuda paychecks. Whether or not their wages are low or high, due to Bermuda’s high cost of living these workers often depending on the additional money in their paycheck to make a living or get by, often still needing to get multiple jobs. But I also completely agree that if a patron feels that the service provided was below par, then by all means opt out of the automatic gratuity and give what you feel fit. Automatic gratuities are initially put in place for the patrons’ convenience when trying to figure out how much is appropriate for good service. I agree. If I had made the full 15% off every bill my restaurant charged I would never have stopped being a waitress. True, but not in all cases. Some places do give full 15% to each server. However it’s rare. In most cases the money is pooled then divided among staff with some being left behind for bonuses and to pay for some staff functions. As someone that has worked in the industry for many years I would like to mention a couple things about the 15% included (none of this defends lousy service. It’s your job do it well or find something else to do). I do agree if you get bad service you should not have to tip however someone stated that on a $100 bill your lousy waitress got $15 and that’s just not true. Any restaurant that charges 15% on the bill DOES NOT give this directly to each server. It is pooled and divided between all service related staff. So if you do get really good service I suggest giving to the 15% directly to your server because he/she really only makes around 10% of the 15% i.e. $200 bill adds $30 for tip, your server in most cases will only get $3 to $10 (depending on the number of staff). Just an observation. I understood that TIPS meant–To Insure Prompt Service. This seems like an incentive program for future service, not for what was necessarily done during this purchase, otherwise it should be paid up-front, in advance. I believe and tip fairly, but on the assumption that TIPS are to insure prompt service, I should have the flexibility of tipping as warranted, not to cover someone’s salary. The owners should be paying fair salaries, and we should be paying for the cost of the service, food, etc. and frequent an establishment based on our ability to pay the total price or not, (as well as to tip or not, rather than to feel guilty for not providing adequate tips when we do not know what the person is being paid. I am an American businessman about to visit Bermuda. I do agree with Mike F that his server was very rude, but talking to a manager is more effective than wishing you could tip below 15%. Furthermore, I believe it is American (and Bermudiian) etiquette that a patron should expect a 15% service charge at any sit-down establishment. The 15% should be considered a fixed cost or a cost of doing business. An extra 3% or more is added if the service was better than expected. If the patron does not want to pay the fixed cost of 15% then the patron is dining at a restaurant that exceeds their budget. In business, if an employee goes over budget, the employee is at fault, not the person the employee is supposed to pay. 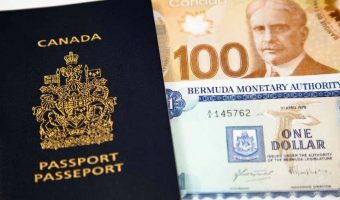 Plus, a few dollars (1 or 2 Sterling Pounds) should not hurt a visitor or an expat in Bermuda. Pete is right about the automatic tip being annoying and a lack of incentive to provide good service. I was recently in Bermuda (1 day removed as I write this.) I just completed dinner with my girlfriend at a restaurant. Three different waitresses cleared the table. We waited for the main waitress to come back and ask about dessert or give us the check. A half hour past, the table was cleared off but no came over. I finally got tired of waiting and got up to get someone. I tracked someone down and expressed my disappointment. She appeared mildly interested and went to find our waitress. Minutes later a waitress handed us the check never asking us if we wanted dessert. I told her in a very polite manner how I felt about the lack of service. She looked at me, laughed and simply said "oh I am sorry" and walked away. The bill was over $100.00 so she automatically made $15.00 plus. So do you think she cared how good or BAD the service was. I believe the patron should have the right to judge the amount of tip to the quality of service. Being fair of course. Most restaurants in Bermuda add the gratuity automatically, true. I have worked in the industry and many people do not realize that servers make a very minimal hourly wage, sometimes as low as 5.00 per hour. Gratuities pay their rent, grocery bill, etc. My experience in Bermuda has been that the service, overall, is excellent and well worth the automatic service charge. To clarify: SOME US states allow "tip credits", meaning you can work under the minimum wage so long as you’re getting tipped to at least the equivelent of the minimum wage. When this doesn’t happen, the employer makes up the difference. In other states, they simply pay the minimum wage like they should in the first place. Bad service = no tip, no matter where you’re at. That said, I usually tip 20% for even a mediocre experience. It’s just how I do things. I don’t see how the comment below relates to Bermuda. Bermuda isn’t the US and workers aren’t paid minimum wage, nor are they subject to income tax. This is a thorny area but tourists should try to be culturally sensitive… The reason it’s important to tip waiters in the US is that they are paid below the minimum wage, and have to pay tax at a rate that assumes they have made 15% tips. So if you choose not to tip they have to pay income tax on money they haven’t earned, and are paid at below what the state regards as the minimum acceptable wage. 15% tipping or above is just part of US culture and doesn’t mean the diner has received "excellent" service. When in Rome, do as the Romans. As a British visitor due to arrive in June, I’m pleased to see there is ‘automatic’ tipping in restaurants. It gets rid of the problem I have when in North America of not knowing how much to tip just to make sure the waiter/ress has a living wage – I’ve seen some websites suggest tipping in N America for normal service at levels I would never imagine paying even for excellent service. If service is poor, just refuse to pay some or all of what I presume is a discretionary charge. The guys at the gas station also expect a tip (if they fill your tank). Most people usually give a dollar. The automatic tipping is very annoying. This is becoming commonplace nowadays. I think many restaurants have forgotten that a tip is for good service and not an automatic surcharge. They should earn it. With these restaurants there’s simply no incentive for the waiter or waitress to give you good service, unless of course they want 30%. Find out about the currency, notes and coins, exchange rates, ATM locations, credit cards, and money transfers. Duty free allowances for both residents and tourists. Find out how much duty you’ll need to pay on goods exceeding these limits.